According to one tradition, the Buddha, the historical personage Shakyamuni Gautuma and founder of the Buddhism, was born (several centuries before Christ) in India in 483 B.C., and died at the age of eighty. He contemplated the preciousness of humanlife and a remedy for the suffering of humanity, after seeing a sick man, an old man and a dead body, and realizing that sickness, death and old age were inescapable for everyone. He preached about how men should live. That was the start of Buddhism. The Buddha did not leave his teachings as writings. So after his death, disciples' opinions about the interpretation of his teachings were different. The teachings of the Buddha were brought to Japan in the form of Mahayana Buddhism. Mahayana Buddhism sharply contrasts with Hinayana Buddhism in stating that it is only through helping others that one can attain benefit to oneself. It also insists that everyone is capable of becoming a Buddha. Beginning in or about first century B.C. in India, the Pure Land teachings were born from Mahayana Buddhism. After that, Pure Land Buddhism was transmitted to China, and was completed by Chinese Pure Land master Shan-tao (613-681) during the Tang Dynasty. Pure Land Buddhism is based on the idea that after dying people are born into the Pure Land in the West where people listen to the teachings of Amida Buddha in order to become Buddhas. However, there were two different ways to be born into the Pure Land: one was the way of emphasizing religious exercises concentrated on the image of the figure of Amida Buddha and of suggesting strongly to perfrom ascetic practices by oneself; the other was that if people would place their trust in the power of the eighteenth vow made by Amida Buddha, to save all who recite his name, they would be reborn into the Pure Land, achieve enlightenment and become Buddhas. In Japan, the teachings of Shan-tao were transmitted to Honen (1133-1212) in the Kamakura period (1192-1333). In his forty-third year, in 1175, Honen came across a passage in the Commentary on the Meditation on the Buddha of Infinite Life Sutra (Kan-muryoju-kyo-sho) written by Shan-tao which ran as follows: "Only repeat the name of Amida Buddha with all your heart, whether walking or standing, sitting or lying; never cease the practice of it for a moment. This is the practice which unfailingly results in salvation, for it is in accordance with the original vow of Amida Buddha that assures common people of deliverance from the painful mundane world by the simple act of reciting Amida Buddha's name." It struck Honen that this was the teaching he had sought for a long time. He soon started to disseminate the teaching of the exclusive practice of the Nembutsu to the common people. The year 1175 is said to be the commemorative year in which Honen became the founder of the Jodo-shu school. It was in 1103, about seventy years before Honen's establishment of the Jodo sect, that Eikan wrote Ojojuin in which he proclaimed the importance of the Nembutsu and gave ten reasons why chanting the Nembutsu would lead sentient beings to be reborn into the Pure Land. Honen's writings suggest he was greatly impressed by Ojojuin. This shows how important a person Eikan was for the Jodo sect. He laid the groundwork for Honen (Fig. 1, Honen Shonin) who would use his thinking as the sole basis for new sects of his own. It has already been mentioned that Honen was regarded as the eleventh nominal chief priest of Eikando. Why and how did Honen become the eleventh chief priest of Eikando? Johen hailed Honen as the nominal eleventh chief priest of Eikando. 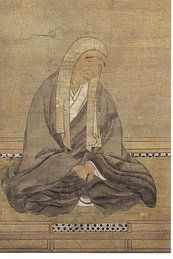 At first Johen, as a famous monk of the Shingon sect, started to read Passages on the Selection of the Nembutsu in the Original Vow as a way to criticize Honen for his incorrect views, but, contrary to Johen's expectations, the writing impressed him with the importance of the teaching of the Jodo sect. Johen revered Honen so deeply that he could not but designate Honen as the eleventh nominal chief priest. In the end, he converted to the Jodo sect. From then until now, Eikando has been revered as the main temple of the Jodo sect. Shoku (1177-1247; Fig. 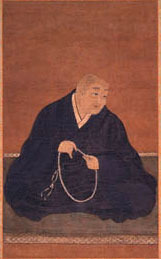 2, Shoku Shonin), one of the greatest disciples of Honen, succeeded Johen. Although Shoku was born into a distinguished noble court family in Kyoto, he insisted on becoming a priest and on studying for the priesthood under Honen when he was fourteen years old. His parents objected, but his resolution was firm. His mother was at a loss what to do, so she stood at the foot of Ichijo Bridge to have his fortune told, because people of that time had their fortune told by standing at the foot of the bridge to listen to the words of the person who was coming across the bridge. As she was standing there, a priest approached while chanting The Lotus Sutra, one of the most important sutras of Buddhism. She felt that Shoku must be deeply related to Buddhism, so she permitted him to become a priest. Shoku was remarkably intelligent, so that he could understand anything, even if he heard only once. His excellence of mind was recognized by his master, and he was given charge of checking quotations in Passages on the Selection of the Nembutsu in the Original Vow. He repeated the Nembutsu 60,000 times as a matter of routine, as Eikan had, and practiced asceticism, called fudan-nembutsu (chanting the Nembutsu continuously) for a limited time. He traveled from Kanto, to Tohoku, encouraging the erection of temples, and spread the teachings of the Nembutsu. He is also known to have produced many copies of the Taima Mandala (Fig. 3) which was circulated from the Kamakura period onwards. The practice of Shoku are called "Shiraki no Nembutsu" demonstrating that sentient beings can never achieve enlightenment on their own, so they should rely entirely on Amida Buddha, reciting the Nembutsu with the pure heart. Put plainly, the Shiraki no Nembutsu is a fundamental practice of the Jodo sect. 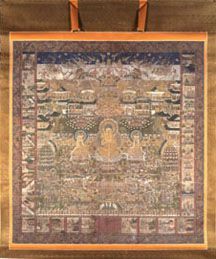 The Taima Mandala offers a visual interpretation of the teachings of the priest Shan-tao. This mandala provides intricately geometric depictions of the Western Paradise. It represents the expected vision of the next world, which appealed to the hearts of the court nobles in the Heian period (794-1185). It shows how earnestly they desired to be reborn into the Paradise. This phrase was coined by Shoku to describe his belief, after a very through study of the sutras, that a simple, plain and pure recitation of the Nembutsu, placing all faith in Amida would lead a believer to the Western Paradais.